To walk the winding streets of Oia was to be continually reminded of the beauty that sometimes comes from tragedy. 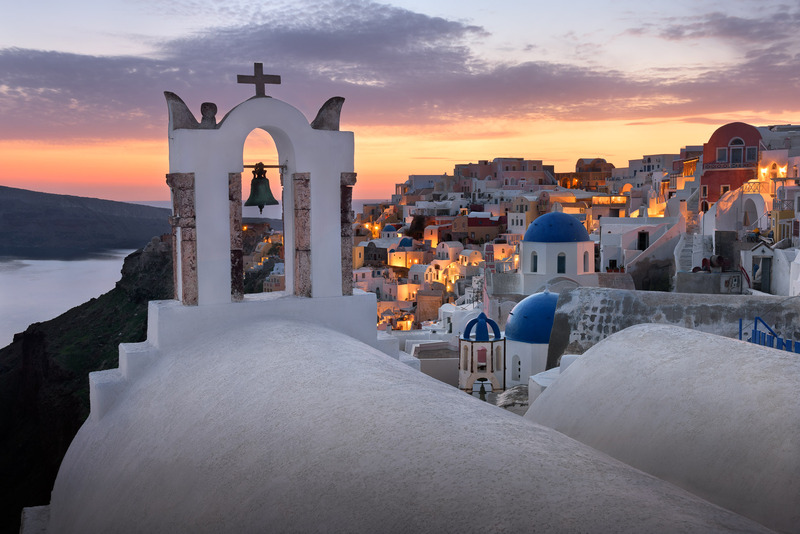 The island of Santorini is famous for its blue-domed churches, and there’s no denying their charm. The image of chalk-white churches and their blue domes against a clear blue sky is perhaps the quintessential postcard image from Santorini. But as with the island itself, there’s an element of the tragic behind the island’s iconic churches. February 2017, single image, additional exposures for highlights, focal length 35mm, aperture f/11, shutter speed 30 seconds, ISO 100, tripod. Perched high on a caldera cliff overlooking the Aegean Sea, Oia was once a village of fishermen, and the lives of fishermen were filled with dangers and uncertainty. The sea that provided for your family could turn deadly; there were no guarantees. And so the people of Oia did what people have always done in times of distress: they prayed. To keep their husbands, fathers, and sons safe at sea, the families of Oia — the wealthy ones, at least built churches. Year after year, one family after another built churches, many of them named for the saints that the fishermen looked to for protection. The lucky fishermen who returned safely brought all manner of treasure — religious icons, crystal chandeliers — and as a result, the churches of Santorini often house remarkable valuables. Most of Santorini’s churches are still owned by the families who built them; they’ve simply been passed down through the years. Like the fishermen who made their living in the Aegean and were keenly attuned to its dangers, to live in Santorini is to live with an understanding that the sea is violent, unpredictable. Many of the tourists who come to Oia and take their postcard-worthy photographs of the town’s sugar cube white buildings are unaware that in the not-so-distant past, Oia was nearly wiped from the earth, and that one of the only things keeping the town alive today are the tourists themselves. On July 9, 1956, a massive earthquake struck Santorini. It lasted only twelve minutes, but in that time, much of the ancient villages of Oia and Fira were destroyed. More than thirty lives were lost, and almost ninety percent of Santorini’s buildings were damaged or destroyed. Much of the local population moved elsewhere, and villages like the ones now famous for their blue-domed churches were in danger of disappearing. Oia and the surrounding towns didn’t really begin to recover from the earthquake until the 1970s, when they began to look to tourism as their lifeline. Here in Oia, so much of its beauty comes from the tragedies of its past. The faithful uttered fervent prayers and built churches to stave off disaster. In the wake of another, later disaster—the earthquake—the town was rebuilt and its churches were refurbished, painted in their trademark blues and whites. As the sun sets over Oia, I think of the incredible beauty of this place and the fragility of life.